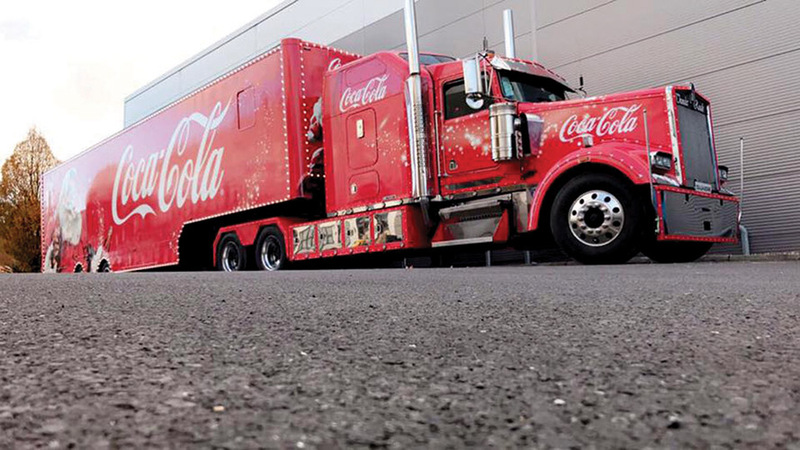 Including the magnificent showcase Coca-Cola truck, Kennedy International’s stunning fleet is one of the largest and most impressive in Ireland. This market-leading, long-serving family business – which provides a vast range of transportation solutions across Ireland, the UK and Europe – will be bringing some of their trucks to the 2017 Full of the Pipe show. If he gets the weekend off, Joe will take his own striking Scania R500 – a wonderful unit which looks fantastic both inside and outside, with the interior fully customised. “I’ve been driving that truck for as long as I can remember,” he notes. As for the switch to Punchestown Racecourse, Joe adds: “It’ll be handy for us anyway because it’s not too far from here. I’ve been at shows in Punchestown before and it’s a very handy location and central, so there should be a big crowd there. “It should be a good weekend. A lot of other truckers in and around us are going as well, so we are all looking forward to it.” And Joe is pleased to report that business is going well for Kennedy International at present: “We’re running a fleet of 52 at the moment, so it’s not too bad,” he concludes. Kennedy International are a wholly Irish-owned transport and haulage company who have been providing their customers with transportation and warehousing solutions for the past 40 years. Their services range from the transportation of a small package to a pallet, multiple pallets or full loads. With one of the longest histories of any Irish haulage company and a vast fleet to boot, Kennedy International continues to be a success story and to set the standard for service to its customers. Operating one of the biggest and most modern fleets of vehicles in Ireland, they are committed to offering a flexible and comprehensive service at an affordable price. They also provide a warehousing service where they can offer customers both indoor and outdoor storage solutions. Services include break bulk, pick & pack and palletisation of loads. They also manage customers’ goods from arrival into the country to delivered end consumer. Kennedy International’s purpose is to offer customers a complete and personal transport service. This family-run company prides itself on its highly-skilled workforce, who are fully qualified and have thorough knowledge of transport procedures. Their reputation for achieving customer satisfaction and meeting customers’ requirements is outstanding. From an ideal location within Dublin Port, their large, flexible fleet of trailers consists of sliders, skelly and low ride tank carriers. Kennedy International is one of the largest container hauliers in Ireland, boasting the equipment, knowledge and expertise to ensure cargo is delivered on time every time. They can offer a full logistics service for goods, i.e. container unloading and loading, storage and distribution throughout Ireland from their state-of-the-art warehouse. Kennedy International offer a next-day delivery service throughout the UK, delivering everything from a box to a pallet to full loads. Their trailer fleet also includes euroliner fridges, flats and lowloaders. All drivers are ADR trained which enables them to also transport hazardous goods throughout Ireland, the UK and Europe. They provide scheduled transportation services, collecting and delivering all types of goods across the continent. All trucks are fitted with mobile phones and satellite tracking systems so that Kennedy International can offer their customers quick responses and the best-possible results.